With the Croozer Kid Plus for 1 single child bicycle trailer, you will be exploring the great outdoors with our deluxe best in class carrier with a self-adjusting Sylomer® suspension for a smooth and comfortable ride for your child. With its 3-in-1 design, your Croozer converts in a matter of seconds from a bicycle trailer to a stroller or jogger. All three conversions kits are included in the box and you can also choose from a wide range of optional accessories. 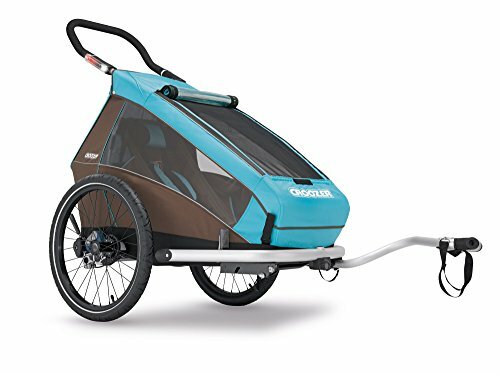 Well equiped for every situation With its cheery, light blue finish your Croozer Kid Plus for 1 is a real eye-catcher, whether being used as a bicycle trailer, a stroller for around town, or a sporty jogger. You can convert it, fold it or open it in a matter of seconds - easy and convenient on trips and vacations. The Croozer also provides you with plenty of room for toys, extra clothing or other items. And our versatile line of accessories can add further capabilities to your Croozer. Perfect road handling with Sylomer® suspension The Croozer Kid Plus for 1 comes with patented Sylomer® suspension that operates with no need for weight-related adjustments. Because the hardness of the spring self-adjusts to the load, maintenance is worry-free. The Sylomer® shock absorption elements are weather-resistant, always retaining dimensional stability even under extreme overloading for short periods of time. This means for example, that rolling over a stretch of uneven ground will not cause the bicycle trailer to bounce or rock; the built-in stabilization evens out the ride. The result: your child can roll along in maximum comfort. Safety Your child will always feel comfortable and be safely protected in the Croozer bicycle trailer. While you're pedaling, your child can sit back comfortably in the innovatively designed, protected child cockpit. In addition, all materials used in the Croozer have been thoroughly tested for Harmful Substances. New Click and Crooz attachment system for all three kits included with the carrier. Airpad Suspension - self adjusting, maintenance free, protects against unwanted bumps and vibrations. Bucket Seats with 5 point "pinch and pull" harness system, supports correct seating posture. Safe Internal Child Space - Protected by a robust internal frame with patented superbar and bumpers. Compliant with applicable ASTM, Health Canada & EN standards. TUV certified - no Harmful substances.